CAUTION: Do not attempt to observe the events described in this post without using approved eye protection. Sunglasses are not enough. The Sun’s light is intense, even during an eclipse, and contains ultraviolet radiation. That stuff will cause permanent damage to your vision. If you are not already an astronomer who understands proper filtering hardware, contact a local astronomy club for advice. Many clubs are hosting public viewing events using safe equipment. If you want to come up with something on your own, read this good advice at Space.com. 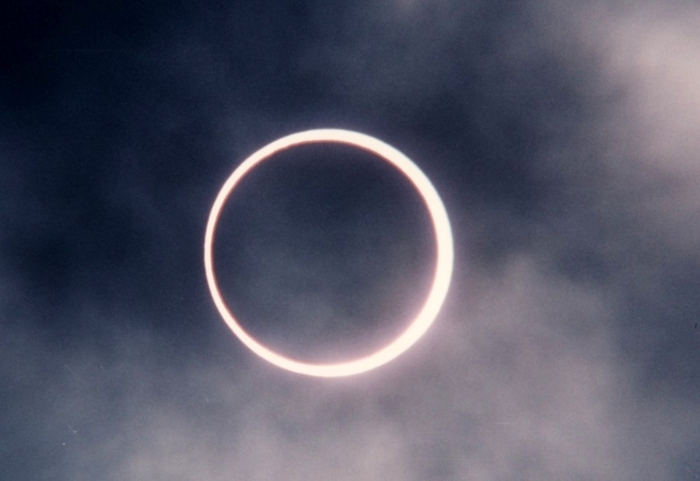 Next Sunday, a solar eclipse will be visible from East Asia through Western North America. It starts in Asia at 20:56 UT May 20th, and ends in North America at 02:49 UT May 21st. If those times and dates are confusing, note they are given in UT (Universal Time). That’s the usual protocol for astronomical events visible from multiple time zones. To convert between local time (what your clock shows) and UT, see our handy Local Time & UT page. What you’ll see in the sky depends on your geographic location. Global eclipse maps are available online: this one’s nice. If you’re lucky enough to be near the centerline, yourself lined up with the Sun and Moon, what you’ll see will be like the animation above on the right. This is what’s known as an annular eclipse, from the Greek “annulus” which means “ring.” Note: Both animations are running at about 1250 times real speed. At maximum eclipse, for a few minutes, a “ring of fire” will surround the Moon as the Sun lines up behind it. That annularity will last for 5 minutes 46.3 seconds at its maximum (a point near the Aleutian Islands). Anywhere else on the centerline, annularity ranges from that maximum down to zero. If you’re outside the path of annularity (which is only about 200 miles wide) you’ll see a partial eclipse, similar to the animation above left. Just how partial it’ll be depends on your distance from the centerline. U.S. readers: check this map. The path of partiality extends as far south as northern Mexico, and as far north as Washington (state) through Kansas. I’d like to point out a few things about my animations. First, yes, I understand that you won’t be seeing any stars during this event (other than our own Sun). But the physics behind this event is occurring out in space, so I chose stars instead of blue sky to better establish our frame of reference. 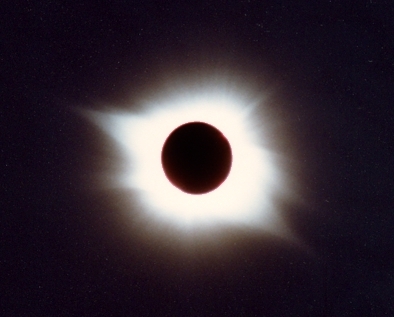 Second, eclipses are often described as “the Moon passing in front of the Sun.” In reality, it’s the Sun that catches up to the Moon and passes behind it. Of course, all motion is relative. These animations show the event as you would see it from the geocentric (Earth based) frame of reference. Third, and maybe you’ve already noticed, the Moon in the annular eclipse animation is slightly smaller. During an annular eclipse the Moon is farther from Earth, so it appears smaller compared to the Sun. The Moon’s orbit around Earth is slightly elliptical, so it can be as close as 356,577 km, or as far as 406,628 km. 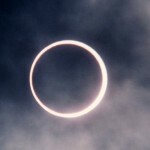 This is what makes an annular eclipse possible. If the Moon were closer, it would appear larger and block the entire Sun. We’d see a total eclipse. like the one I photographed below at Cabo San Lucas in 1991. Click to enlarge. 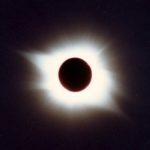 I traveled to New Mexico back in 1994 to photograph another annular eclipse. Clouds in the sky filtered out most of the light. I didn’t need any special filters on my camera, so I attached it directly to a spotting scope. [I still used eye protection when looking toward the Sun.] What I got is shown below. Click to enlarge. As you can see, I was almost exactly on the centerline. Missed it by that much … < 1 mile. But there was no road, and it wasn’t public land. So good luck catching this celestial event, and clear skies! I’ll be at my home in New River, AZ, photographing the partial eclipse through an Hα (hydrogen alpha) filter. These high-tech filters can capture solar flares, in addition to the silhouette of the Moon. Watch for my results here in Sky Lights 2 or 3 posts from now.